Rentisa - Pensionado - Inversionista Which status is right for you. 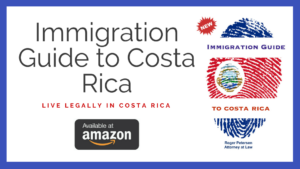 If you need advice on Immigration in Costa Rican then give us a call. We have extensive experience in processing residency status in Costa Rica. The Pensionado (Retiree) applicant must demonstrate a permanent fixed income from a pension or similar retirement income of at least US$1,000 per month. The typical applicant in this category has a government, private sector pension or social security retirement benefits. The legal basis for the this category is Article 81 of the Immigration Law 8764. The Rentista applicant must demonstrate a source of income of at least US$2,500 per month. You can provide a letter from your financial or banking institution indicating that you will receive $2,500 in Costa Rica in a permanent and stable manner for 2 years. The other option is to open an account in Costa Rica and have the local bank issue the income letter for immigration. The Investor category is designed for individuals that come to Costa Rica to invest in the country. The minimum investment required is US$200,000. According to Article 87 of the Immigration Regulations in order to qualify for Investor status the applicant can invest in real estate, shares of corporate stock, negotiable instruments, productive projects or projects that are in the national interest. The Immigration regulations specify the documentation that will be required to prove the investment. The applicant must provide a detailed description of the investment that is being made. If the investment is made in real estate then the applicant must present a certificate of title issued by the National Registry of the property that will be the basis for the application along with a valuation from the local Municipal government to demonstrate the value of the real estate.